I've been going through a bit of an art slump recently and I'm trying desperately to get out of it. Strangely I decided to draw Luigi again. I've gotta get back to drawing B.E.N., though. But I thought I'd upload this real quick and get it out of my system. In the Mario and Luigi RPG games, yes, he does. Beautiful style for Luigi. Really reminds me of the Mario and Luigi series artwork. Great work. NUUUUUUUUUUUUU WEEGEE AWESOME!!!!! !Oh, wait you knew that. Nice pic. Like the artstyle you've used. Mario may be the star... but everybody remembers Luigi. That's the Luigi charisma we all know and love!!! Excellent work, good shading, clean lines, he looks wonderful. I Love Luigi! He, to me is one of, if not the BEST Mario character! I love the way you've drawn him here, and do I spot the red and white striped socks from the "Mario & Luigi" Games?! Nicely done. I love his face expression and his pose. The coloring and shading is good too. It's rare that I see him drew so perfectly, Awesome!! I'm glad you like it so much. 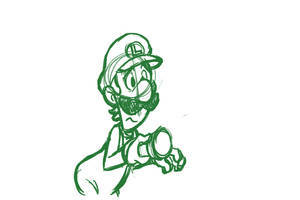 Actually, a friend of mine and I are considering doing possibly a one-shot comic rendition of Luigi's Mansion. It'll be a long while before we get around to it though, but I'd certainly like to do it. Well, that'll depend on you. You do what you feel is write for your story. And thanks. It's still up in the air right now, so who knows. U DRAW LUIGI LIKE HE'S SO CUTE!!!!! It's nice to see that your out of your artblock. And what better way to do that (Besides drawing B.E.N), then to do a drawing of Luigi! Yes, and in fact, I'm working on another short comic with B.E.N. It'll be an epilogue to my first short comic Humanity. I'm glad to hear that . I can't wait to see it! I'm in such a Luigi mood right now over the new Luigi's Mansion game, that this just makes me extra happy lol. Thanks! Believe it or not, I drew this from memory of an official rendering of him from Mario Party 9. I gotta make a trade with you sometime lol. That'd be fun! Or maybe even a collab. I've never done one of those before. I never notice Luigi's white and red socks. You never really see the socks except for the Mario and Luigi RPG series. I drew them here just because I like them that much. Luigi's 'stache: manlier than Mario's. Weegie's here to save the day!